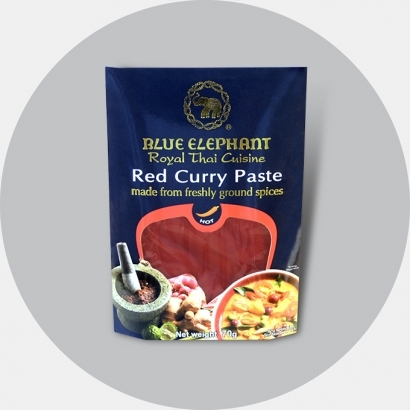 Red curry paste is a classic Thai dish, traditionally prepared by blending fresh herbs, spices and red chilies into an aromatic red curry paste. Hand made. Ingredients: citronelle16,2%, chilli pepper 16%, garlic 15,8%, soya oil, shallot 12,7%, laos root 8,3%, salt, lemon kaffir zest, powder of coriander seeds 2,4%, koriander root 1,4%, basil leaves, seeds of cumin powder, white pepper, citric acid (E330). Allergenes: may contain traces of soy. 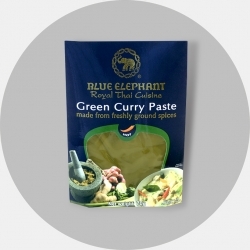 Manufactured in environment where are used sesame and peanuts. Keep in a cool, dry place. Once opened, keep 1 week in the fridge.